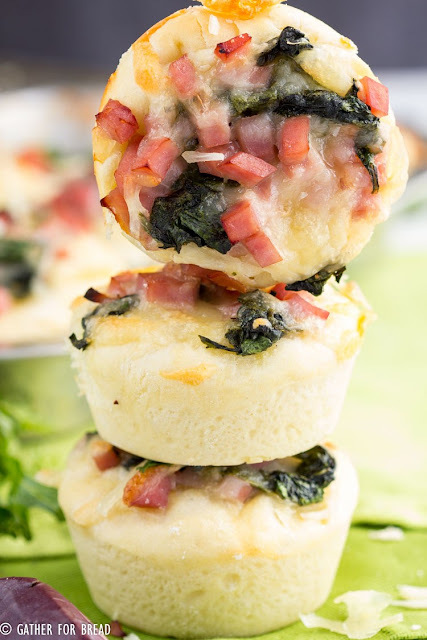 Ham Swiss Spinach Buns – Savory homemade dough wrapped up with diced ham, Swiss cheese and topped with spinach. These buns are perfect for breakfast, brunch or dinner and can easily be a grab and go hot meal. What I love most about brunch is that no matter what time of day I serve it, my family receives it well and loves all the goodies I make. With Smithfield, you can bring easy ways to cut meal prep and bring homemade favorites to the table any time of the day. Savory homemade dough wrapped up with diced ham, Swiss cheese and topped with spinach. These buns are perfect for breakfast, brunch or dinner and can easily be a grab and go hot meal. In a large mixing bowl, combine warm water and sugar. Sprinkle yeast over the warm water. Let dissolve. Using the flat paddle mixer attachment stir in the oil. Add egg, salt and 1 cup of flour. When combined, switch to dough hook and add additional 1 1/3 cup of flour. Knead for about 3-5 minutes, until smooth and elastic. Cover with a damp cloth while you make the filling. Meanwhile, in a medium skillet over medium heat, add olive oil. Once the oil is hot, saute garlic for 1 minute, until fragrant. Add spinach and cook until wilted, about 3 minutes. Set aside. Grease a 12 cup muffin pan very well. Divide dough into 12 equal balls. Place each dough ball in muffin cup and press along bottom and sides to form a well in the center. Combine spinach mixture, Smithfield Anytime Favorites Diced Ham and Swiss cheese. Using a medium cookie scoop divide Smithfield Anytime Favorites Diced Ham and Swiss mixture evenly among the 12 cups. Bake for 15-18 minutes or until dough is golden brown and cheese is melted. 0 Response to "HAM SWISS SPINACH BUNS"